Wi-Fi is great for wireless broadband Internet access in your home or office (see the Wireless Alliance. Wi-Fi on the road is more problematical -- Libraries and coffee houses may offer free Wi-Fi, while hotels and airports often have rather expensive for-pay services. And security is an issue in public hotspots -- free open services are wide open with no security, and the first thing you have to do with for-pay services is to broadcast your credit card number. So each time you stop and open your laptop, you first have to figure out the requirements of that local environment, find the right service, possibly enter special ID information, and then sign up for some period of service. For example, when visiting a hospital in Boston I was thrilled to find free Wi-Fi service, which mostly worked great -- on the weekend. But during the week it became unusable as the demand increased, requiring multiple attempts to connect and even just check e-mail. Back in the hotel, we had the option of wired or wireless Internet connections, at $10.45 a day -- for each. You could not switch back and forth between the two different services, so you could use the possibly faster, more reliable, and more secure wired connection in the hotel room, but then pay extra to access the wireless connection in the hotel lobby and conference rooms. Thus the attraction of mobile Internet access through cellular data services. Cell towers are everywhere, and can provide a more secure connection without easy snooping from your neighbors in the coffee house, plus cell-based service breaks the bounds of finding individual local hotspots to provide ubiquitous coverage anywhere in range of cellular coverage -- not just specific locations, but in any hotel or restaurant, or even on the go on a train or the back seat of a car. To check out mobile Internet on my laptop, Verizon Wireless kindly loaned me a Sierra Wireless AirCard 595 to try out their enhanced EV-DO Rev. A service on a recent trip It delivered the promised DSL-like data rates for my notebook computer -- download to over 1,000 kbps and upload to around 720 kbps (kilobits per second). Verizon's mobile broadband Internet service is built on its high-speed data service, called BroadbandAccess EV-DO (Evolution-Data Optimized), used for Verizon's V CAST wireless video and music services to download clips for playback on mobile phones, and for faster e-mail and even Web surfing on PDA devices like the Palm Treo. The original EV-DO service had asymmetric data rates, with much faster download (for fast delivery to the handset) than upload, with quoted average download speeds of around 400 to 700 kbps, with burst rates of 2 Mbps, and 10X slower average upload speeds of 40 to 60 kbps. This is still some 6X faster then Verizon's basic data service, NationalAccess (CDMA 1xRTT), with typical download rates of 60 to 80 kbps, with bursts to 144 kbps. EV-DO Rev. A (Revision A) service steps up the upload rates to near parity, with average upload speeds at 300 to 400 kbps and average download speeds of 450 to 800 kbps. In the Philadelphia region, Verizon quotes typical download speeds of 600 kbps to 1.4 mbps (burst up to 3.1 mbps) and typical upload speeds of 500 to 800 kbps (burst up to 1.8 mbps). Many new mobile phones support faster EV-DO data service with the Verizon Get It Now data services, including downloadable applications, games, mobile Web & e-mail, and V CAST video and music. And you can use a wireless PDA like the Palm Treo to check and send e-mail (including attachments), interact with websites (including checking airline schedules), and access services like Google Maps. Internet access through handheld devices is very useful on the go. The next step is leveraging the cellular data service to provide full Internet access for your notebook computer. You can use some mobile phones and PDAs this way by connecting them up to your computer as a wireless modem, but this requires extra cabling and set-up, and ties up your phone -- plus may require an extra monthly charge. Or you can go the next step and use a wireless card that plugs in to the PC Card slot on your laptop. Yes, this requires a separate monthly subscription, but it means you can access the Internet wherever you are, whenever you want. As of the end of February, Verizon reports that its BroadbandAccess / EV-DO service is available in 242 major metropolitan areas and 180 major airports, covering more than 200 million Americans. Verizon also began rolling out its faster EV-DO Rev. A service in January 2007 in the greater Chicago area, and by the end of February it was available in 95 percent of my Tri-State Philadelphia region (southeastern Pennsylvania, New Jersey through Princeton and north, and Delaware), plus along the Northeast Corridor from Washington D.C. up to Boston. The Rev. A service also is available in major cities across the country, to San Francisco and San Jose, California, but not yet in Los Angeles. I tested the Sierra Wireless AirCard 595 in the Princeton, New Jersey area using both Web speed tests and long FTP transfers. The Rev. A service provided sustained download rates of 700 to 900 to 1400 kbps and upload rates of 500 to 800 to 900 kbps, which correspond well to Verizon's numbers. I then tried the card in Palm Springs, California, with the non-upgraded original EV-DO service. There I saw similarly fast download rates of 700 to 800 to 1300 kbps, but the much lower upload rates of 128 to 160 kbps. Amazingly the EV-DO service even was still available at the edge of the national park north of Palm Springs. In my testing with e-mail, browsing, and video streaming, the throughput was relatively continuous, albeit not as smooth as a typical DSL or cable connection -- There were some visible short delays in downloads of several seconds or more, and I did need to reload websites occasionally. 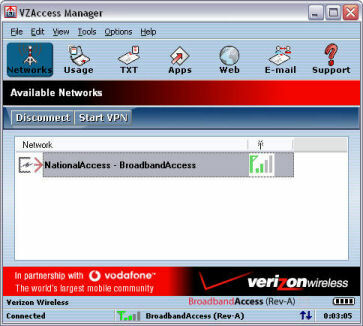 To use the service, run the Verizon VZAccess Manager software to set up the card as a dial-up device under Windows XP. VZAccess Manager provides a wizard to step through the process of activating the hardware, and has helpful test and information displays, plus a real-time statistics display. You then just double-click to connect to the service, and then double-click again (or turn off your computer) to disconnect. Cellular wireless Internet service can make a lot of sense for keeping a notebook connected wherever you are. It's more convenient and more secure than juggling with different Wi-Fi connections each time you set up at a new location, and it's just there -- without requiring hunting around for a compatible Wi-Fi hotspot. One issue, of course, is the cost -- you're basically adding a new mobile phone and its own full data service. Verizon offers the Sierra Wireless AirCard 595 for $99.99 with a two-year contract, plus $79.99 per month for "unlimited access" data service. Another issue is bulk -- the AirCard juts out several inches from the PC Card slot, so you can't leave it permanently installed in your system. But for people who need fast and immediate broadband access on the go, cellular wireless data service certainly is a compelling option. This will be even more so as these devices get smaller and are integrated directly into more notebooks. See more in the Mobile Communications Gallery, under Mobile Internet and Multimedia. See Mobile Media and Navigation article, under Mobile Phones. This entry posted on March 18, 2007. Previous: Audio Editing for Video: Adobe Soundbooth. Next: Verizon G'zOne Rugged Phone.